Showcase Members of Nicar, LoopNet, Co-Star, Catalyst & Build Out. Also, offering MLS services to our clients. Sean Ryan was honored to receive the 2013 & 2014 Industrial Broker of the Year Award. Sean continues to work hard for Commercial clients and offer unsurpassed knowledge & experience to negotiate great terms. 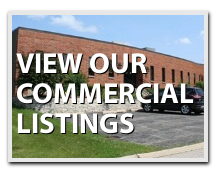 Contact Sean for all of your Commercial Real Estate Needs! Ryan and Company Realtors announced the sale a 13,000 square foot industrial facility at 160 Chicago St. in Cary. Sean Ryan of Ryan and Company Realtors in Wauconda represented the purchaser, International Dryer Corp. The company makes equipment to wash cars, buses, trains and trucks. SCHAUMBURG -- Ryan and Company Realtors recently sold a 11,000 square-foot industrial property at 2328 Hammond Drive in Schaumburg. Seller/Keith West was represented by Sean Ryan-Ryan and Company Realtors and the purchaser Palmer LLC was represented by Matt Baines-Interstate Realty. Ryan and Company Realtors, Inc. of Wauconda recently represented the buyer in the acquisition of a commercial parcel in Prairie Grove. The sale of the industrial/retail/office multi-unit condominium complex at Prairie Business Center totals over 38,000 square feet. The complex is located on Route 176 just east of Route 31. Sean Ryan of Ryan and Company Realtors represented buyer Bellagia Properties LLC, and Stephanie Burrows of Re/Max Unlimited represented the seller. Leasing opportunities will be available in the first quarter of 2013. WAUCONDA -- Ryan and Company Realtors Inc. recently participated in the sale of 285 Industrial Drive, Wauconda. Intrepid Molding Inc. purchased the 30,000 square foot industrial facility in October. Intrepid Molding is an injection molding company established n 1993. Owners John Webb and Mike Durkin are pleased they could remain in Wauconda and expect to relocate to their new headquarters in the 1st quarter of 2013. Sean Ryan of Ryan and Company represented the purchaser and Michael Bacik and Ryan Kehoe of Grubb & Ellis represented the seller.